1 trucker musician | This Blog Rules | Why go elsewhere? 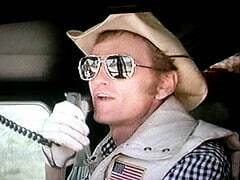 Jerry Reed is probably the most recognized trucker musician. He was a singer/songwriter and actor. His personality shined through in a way that drew people into to what he was doing. In 1959, Reed’s song “Soldier’s Joy” hit the charts of the Bubbling Under The Top 100 and Cashbox Country. Reed continued his run as a hit maker in the 1960’s with “Guitar Man” and he wrote songs for Elvis Presley and Johnny Cash. The 1970’s were good to Jerry Reed and he made the most of it! He hit number eight on the U.S. billboards with “Amos Moses” in 1970, a hybrid of rock, country, cajun and funk. In 1971 his song “When You’re Hot, You’re Hot”, became the number one song in America on the country music billboard charts. He also performed the song on the Glen Campbell Goodtime Hour. On December 9, 1972, Reed became a mainstream star when he was made into cartoon form as himself in the hit television show “The New Scooby-Doo Movies” in the episode “The Phantom of the Country Music Hall”. Reed played the infectious “Pretty Mary Sunlight” in order for the Scooby-Doo gang to find him after his guitar went missing. This episode of Scooby-Doo was his jumping on point to his acting career as he was about to become a star! In 1974, Reed began his acting career along side of close friend Burt Reynolds in “W.W. and The Dixie Dancekings”. “Gator” followed in 1976 as well as 1978’s “High Ballin'” and 1979’s “Hot Stuff”. His biggest movies were the “Smokey and The Bandit” trilogy, the first in 1977, that featured Reed as a truck driver helping his friend Burt Reynolds. His song “East Bound and Down” landed him a spot at number two on the charts. Reed delved into many things toward the end of the 1970’s with “The Jerry Reed Show”, a guest spot on television show “Alice”, a tribute album to his good friend Jim Croce called “Jerry Reed Sings Jim Croce”, and a made for television movie “Concrete Cowboys”.